Inexplicably, I find myself moving toward the sound, searching for signs of life. Instead, I find death. The source of that scream remains a mystery as, across a clearing, I see what looks like a pile of clothes. But as I approach, it becomes apparent it’s more than just clothes I’ve spotted. In a small hollow, just below a tree, and curled up like a baby on a thick bed of dead leaves, lies a man, his thinning gray hair matted across his balding cranium. His pasty upper torso is shirtless, while his legs are covered only by black long johns — with blue-striped boxers sticking out above the waistband — and a pair of woolly socks. Under his bent legs a pair of slacks, a white shirt and a jacket have been spread out as a cushion at his final resting place. Scattered around are innumerable documents, a briefcase and other remnants of a former life. Nearer to him are items more closely related to his demise: empty packets of prescription pills, beer cans, and bottles of liquor. Seemingly this man, who looks to be in his mid-50s, had drawn his last breath before I heard that unsourced, chilling cry. Evidence of such pilgrimages is strewn amid the dense undergrowth. 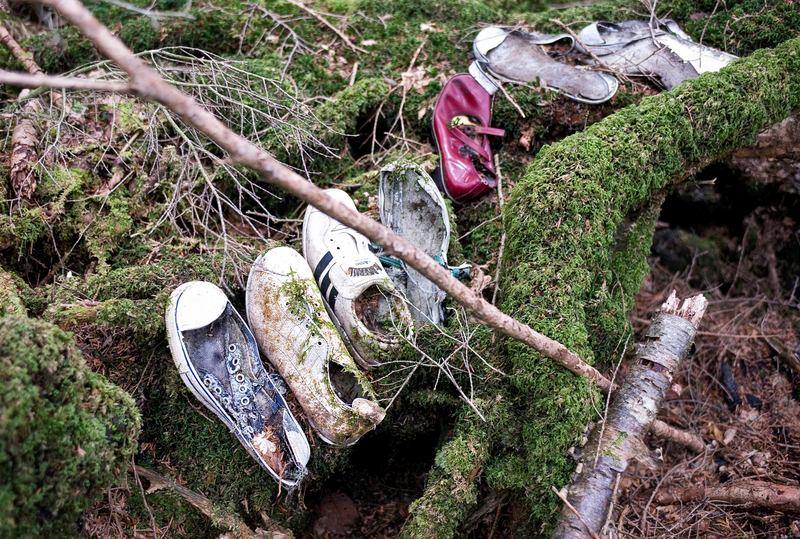 Four pairs of moss-covered shoes are lined up on the gnarled roots of a tree — two adult-size pairs and two children’s pairs. 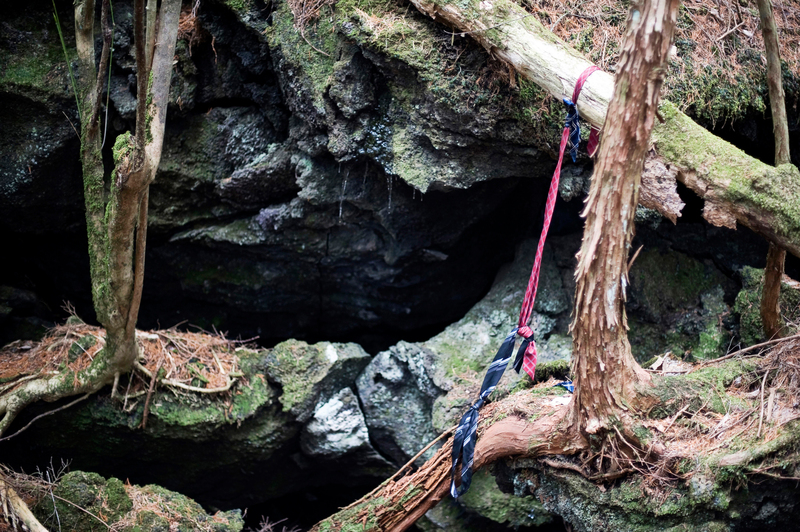 Nobody can know exactly how that line was answered — there was no sign of life, no sign of human remains. Local police suggest wild animals often get to corpses before they do, so clouding the issue of exactly how many achieve their goal and end it all here. Nonetheless, bodies are frequently discovered in monthly sweeps coordinated by the police and local volunteer firemen. 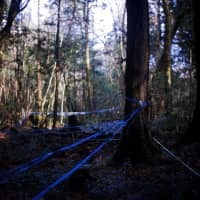 As they move around the forest, these searchers leave color-coded plastic tapes strung between trees to mark where they have searched and where they have found items or bodies — or sometimes simply to mark their way back out of this sylvan maze. 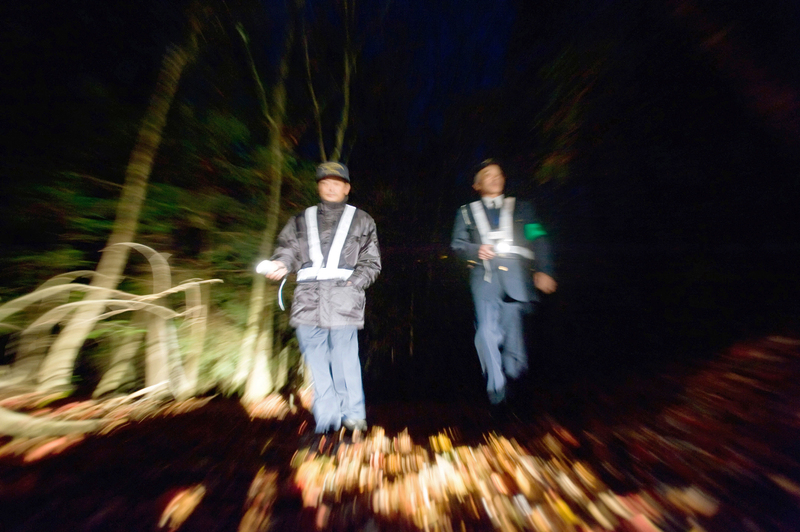 Altogether, police records show that 247 people made suicide attempts in the forest in 2010 — 54 of them successfully. Local officials and residents believe that number could be significantly higher. 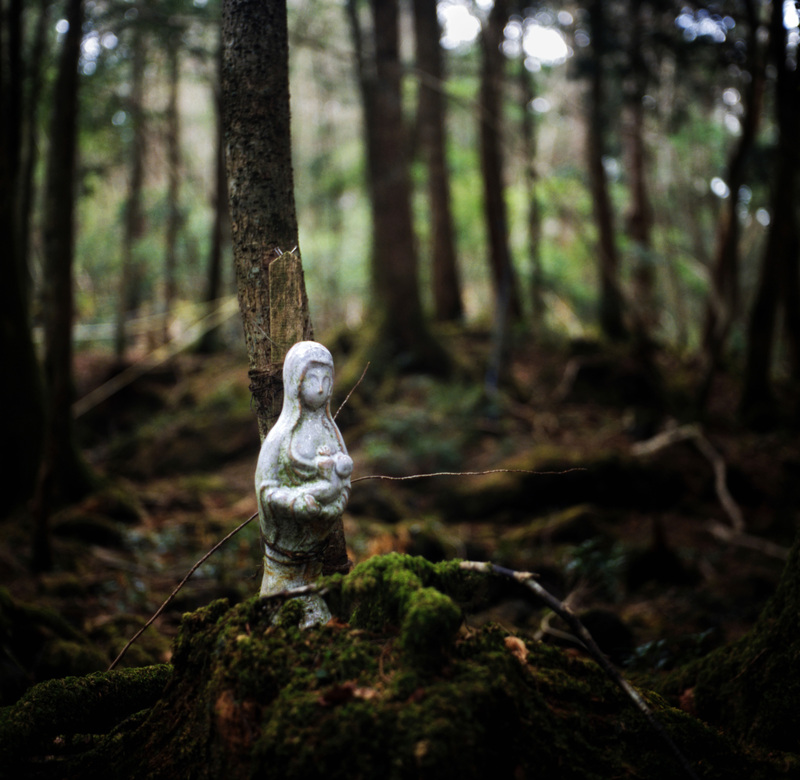 “There are people who come here to end their lives in Aokigahara Jukai but, uncertain as to where exactly the forest is, kill themselves in neighboring woodland,” said Masamichi Watanabe, chief of the Fujigoko Fire Department that covers this area. 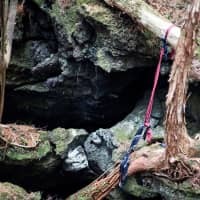 Even so, his officers still recover an annual average of 100 people from the forest in various states of consciousness — including an increasing number who tried to take their lives by inhaling toxic gas in their cars, either from the exhaust or charcoal-burners they bring with them. “What is certain, though, is that the numbers continue to rise each year,” Watanabe added. This is also the case nationwide. In January, a National Police Agency (NPA) report indicated that 31,690 people committed suicide in 2010, the 13th consecutive year in which the figures topped 30,000. 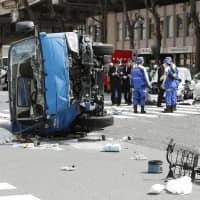 In fact, according to World Health Organization data, the suicide rate in Japan is 25.8 per 100,000 people — the highest among developed nations, and more than double that of the United States. Experts are quick to point out the impact of the global financial crisis, especially since the world’s third-largest economy suffered its most severe contraction in over 30 years in 2009. Already there have been several suicides by relatives of disaster victims, while the long-term effects of life in evacuation shelters may also lead to depression and thus, directly or indirectly, to further suicides, Cho added. 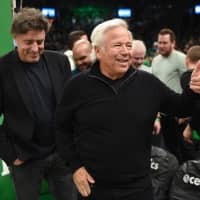 According to NPA reports, a major suicide trigger in 2010 was depression, and some 57 percent of all the suicide victims were out of work when they died. Among those, men in their 50s were most numerous, though men in their 30s and 40s has been the demographic showing the biggest percentage increase in the past few years. “This generation has a lot of difficulty finding permanent jobs, and instead people take on temp work that is unstable and causes great anxiety,” said Yukio Saito, executive director of Inochi no Denwa (Lifeline), a volunteer telephone counseling service that last year fielded nearly 70,000 calls from people contemplating suicide. Although financial worries are undoubtedly major drivers of modern-day suicide, other unique cultural and historical factors also seem to play a part. 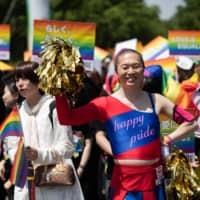 In some countries, suicide is illegal or at least largely unacceptable on religious or other moral grounds, but in Japan there is no such stigma. The tradition of honorable suicide dates back centuries to Japan’s feudal era, when samurai warriors would commit seppuku (ritual disemboweling) as a way to uphold their honor rather than fall into the hands of an enemy. The present-day acceptance of suicide stems from this, Cho said. “Vestiges of the seppuku culture can be seen today in the way suicide is viewed as a way of taking responsibility,” he observed. 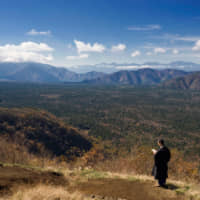 Japan is also subject to suicide fads, and Seicho Matsumoto’s 1961 novel “Nami no To” (“Tower of Waves”) started a trend for love-vexed couples, and then jobless people, to commit suicide in the Aokigahara Jukai. The book, which this year posts its 50th anniversary, concludes with its beautiful heroine, who is involved in a socially unacceptable relationship, heading into the forest to end her life. 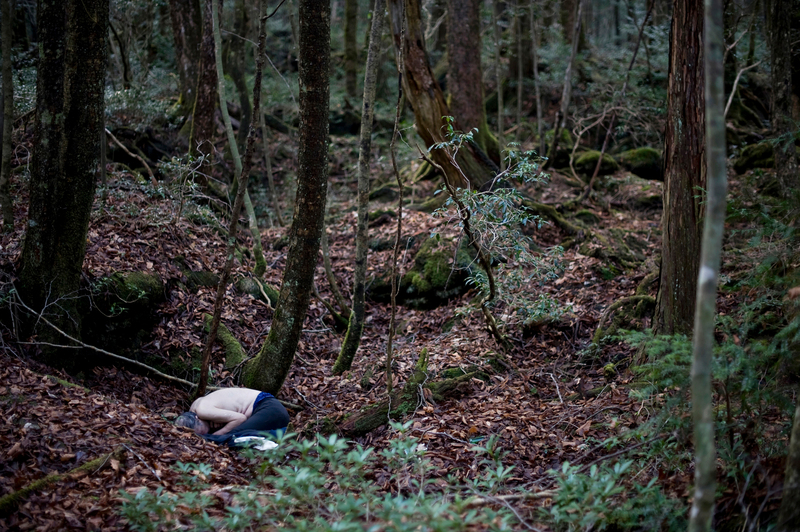 In fact that suicide trend in the forest peaked in 2004, when Yamanashi prefectural police figures show 108 people killed themselves there. 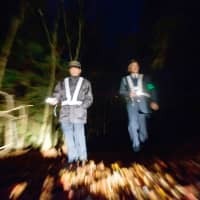 In recent years, local authorities have implemented measures to try and reduce that toll, including siting security cameras at the main entrances to the forest and carrying out round-the-clock patrols. At the entrances there are also signs that read: “Think carefully about your children, your family.” Below them is the phone number of a volunteer group headed by lawyers specializing in debt advice, as debt is a common suicide trigger. The signs were erected by 38-year-old Toyoki Yoshida, who himself attempted suicide due to debt. He blames Japan’s money-lending system, which the government has now reformed to a degree. Vigilant shopkeepers also play a role in the prevention effort. Hideo Watanabe, 64, whose lakeside cafe faces an entrance to the forest, said that he has saved around 160 people over the past 30 years. 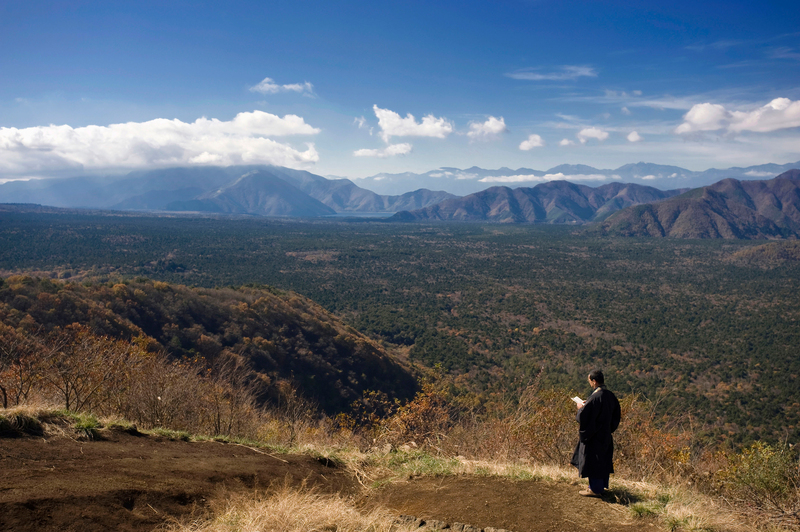 Showzen Yamashita, a priest who conducts Buddhist rites in the forest to pray for the repose of the thousands of people who have died there over the years, agreed, adding that the lack of support networks in Japan is a main cause of the ever-increasing suicide rate. Rob Gilhooly’s photo-story “Suicide Forest” was awarded a special prize by jury in the 2011 Days Japan International Photojournalism Awards and an honorary mention in the OnAsia International Photojournalism Awards for 2010.